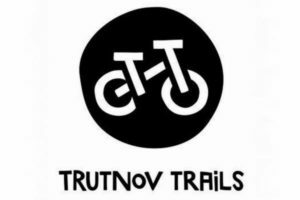 Trutnov Trails, true trails in Czech Republic - BIKO BLOG - Cycling in Prague, Czech Republic & more! 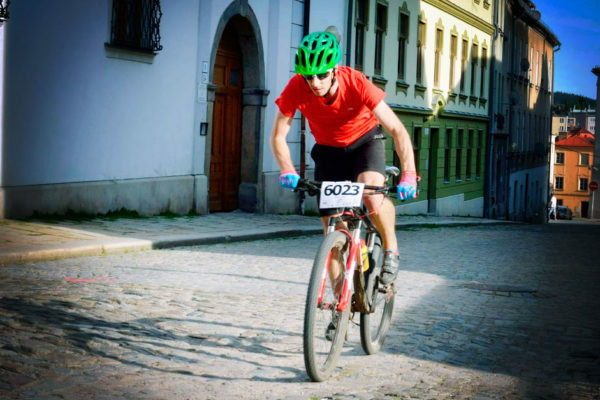 Trutnov Trails HQ is located in the little village of Lhota, Lhotecká 6, Trutnov 541 01. Opening hours Sat–Sun 9.00–20.00 from May to October. You can rent different models of Giant and Liv bikes like Trance, Stance, Reign, Liv Pique and Liv Embolden. Prices from 500 to 700 CZK per day. Deposit from 2000 to 4000 CZK. 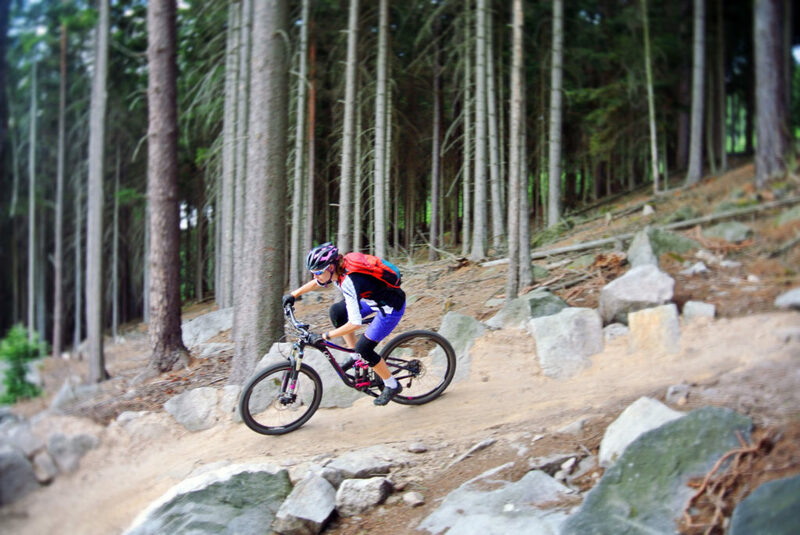 There are 4 main trails in TT center for a total of 17 Km of riding. 17 km is not a lot (however the number is growing every year) but even if you ride the trails only twice you will climb quite a lot at the end of the day. 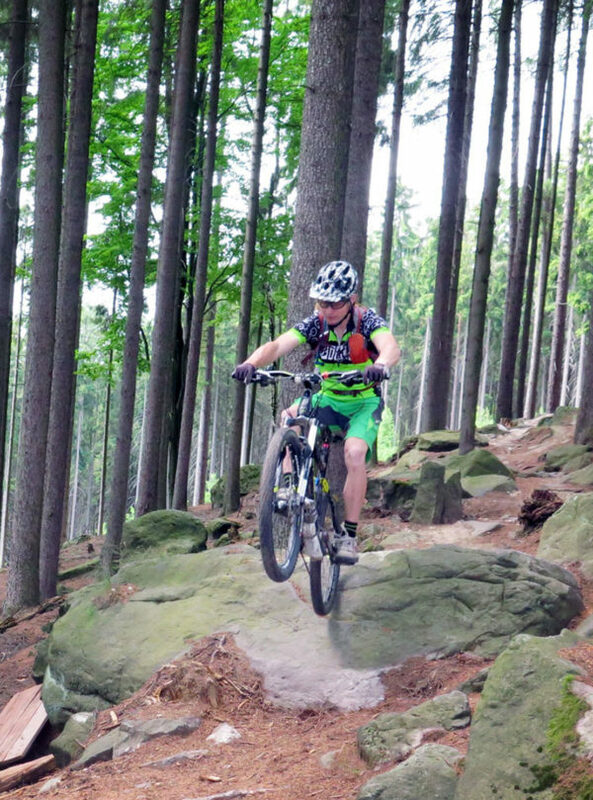 The three most important trails start almost from the same spot, called „U jeskyňky“ (at the cave), on the top of a hill which you will reach riding the only one official uphill trail called “Panský stoupák”. Especially the last part of this climb is really fun (and hard) to ride. Once you get there, clear marks will tell you where the beginning of each of the three trail is. Every trail has a different difficulty level. 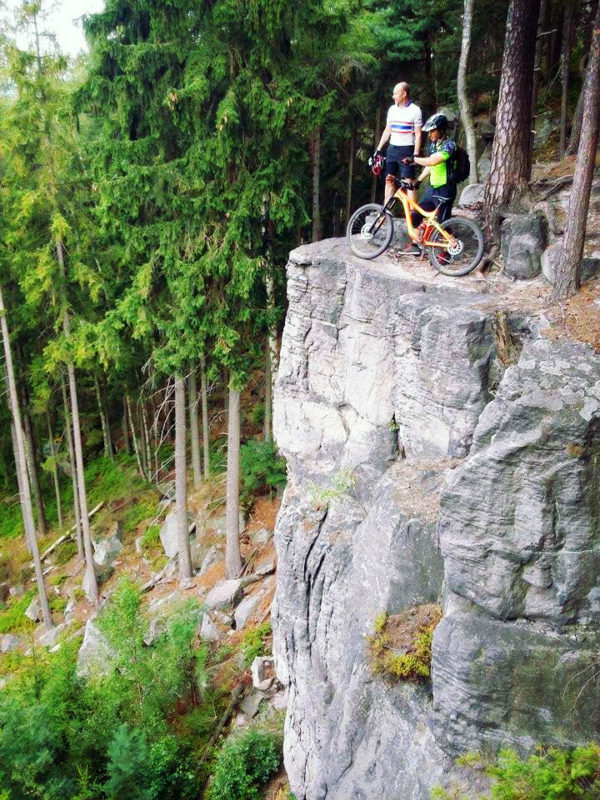 The easy blue is called Kozí trail (because it runs through a rock formation called Kozí kameny – Goat rocks), the intermediate red trail is called Modřínový (from large Larch trees, Modřín in Czech) and the black trail for experienced bikers is called Trail Pod Jeskyňkou (trail under the cave). 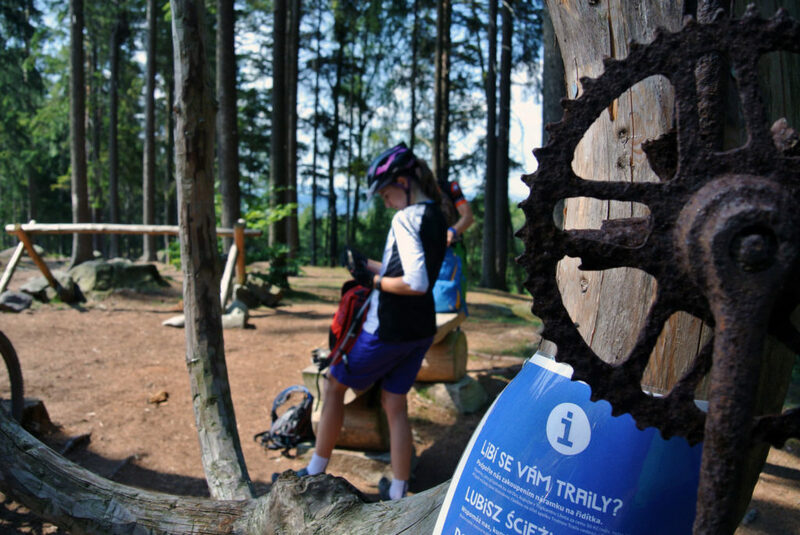 The fourth trail – Bunkr trail is located on another hill and starts from a nearby lookout tower. It is designed to be an easy trail. Bunkr trail (5 km – GPS) starts from Slavětínská looukout tower from where is a beautiful view to Krkonoše mountains and also smaller Vraní and Orlické mountains. And why Bunkers trail? Because it follows old Czechoslovakian border fortifications built from 1935 to 1938 against Nazi Germany. So you can stop along the way and go exploring some bunkers and take a few cool pictures! 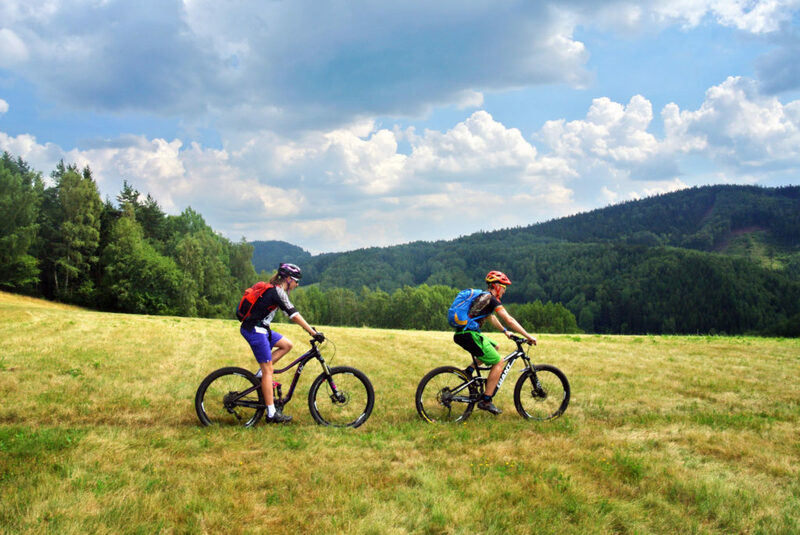 This trail is cross country oriented, it is natural and known for gorgeous panorama views. Panský stoupák (GPS): It is the uphill that takes you to the following trails. The lenght is approx 6 km. Kozí trail (GPS) is one of the most popular trail. 2,5 km (for now) of nice flow which put a smile on bikers’ faces of all skill levels. 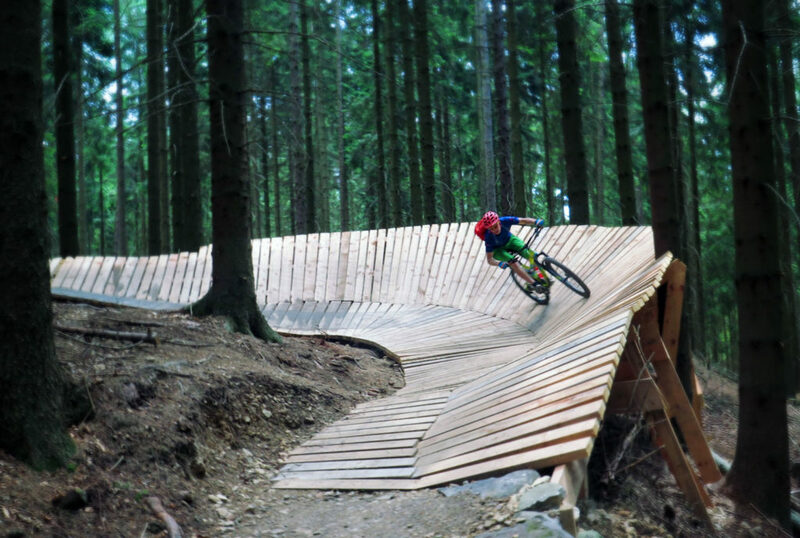 It has some nice features like riding on logs or a huge wooden wallride situated on the IMBA section. The second part of Kozí trail is under construction now and should be open in 2017. Modřínový trail (GPS)was the first trail built in the area of the well known Čížkovy kameny. 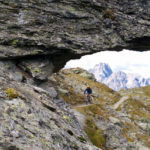 It´s a natural raw trail with a length of 3,3 km. The diversity of this trail is quite big. 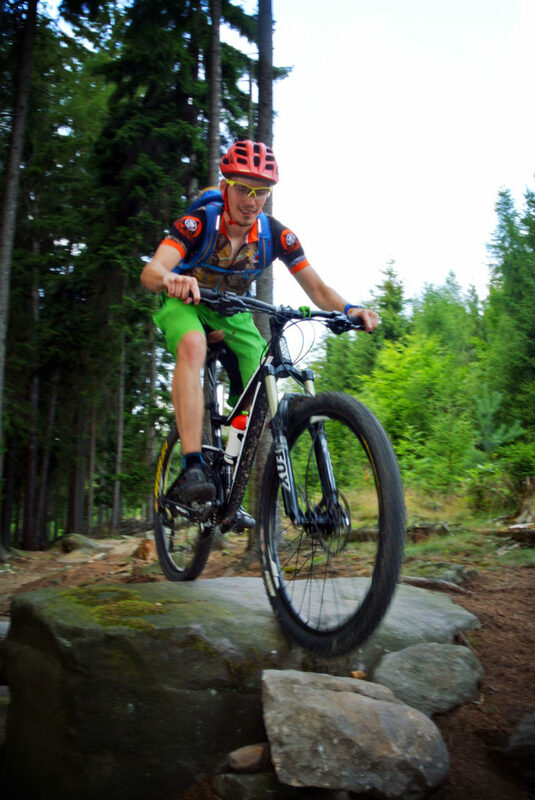 From fast loam and rooty trails to medium technical and rocky one. 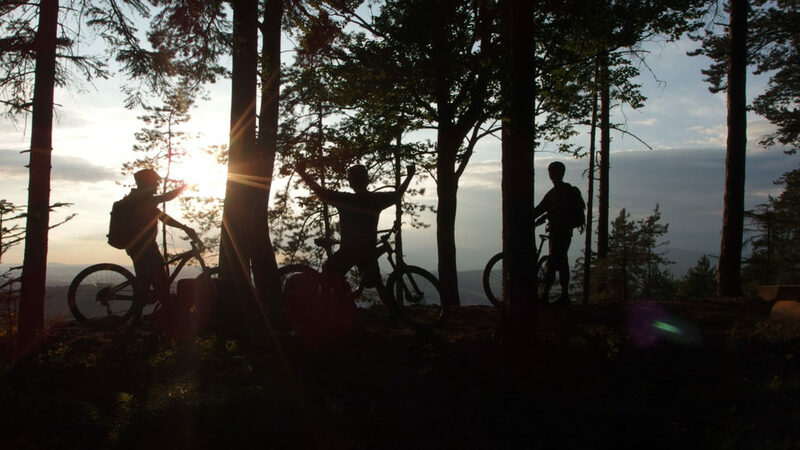 Nice feature in the first part of this trail is riding close to the rock edge from where you can enjoy a beautiful view of Krkonoše mountains, the highest mountain range in the country. 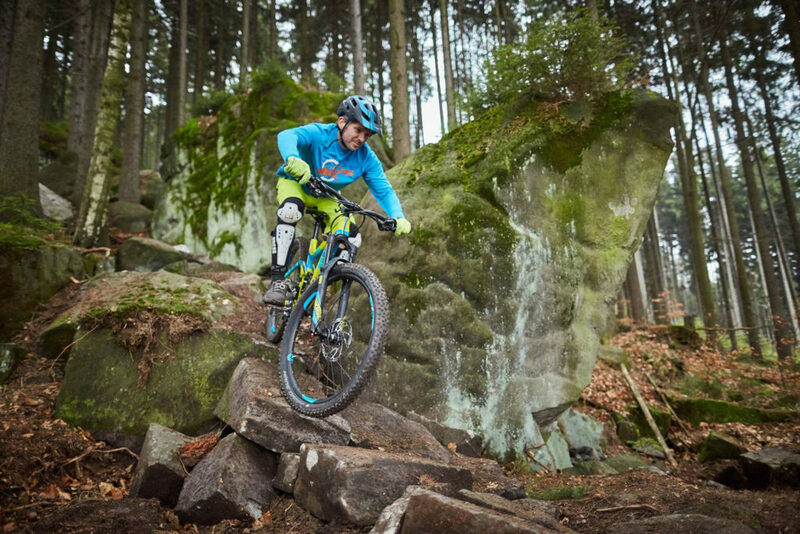 Also very memorable and fun to ride is the „Flinstone line“ a trail section made from big rocks (everything handmade by local trailbuilders). 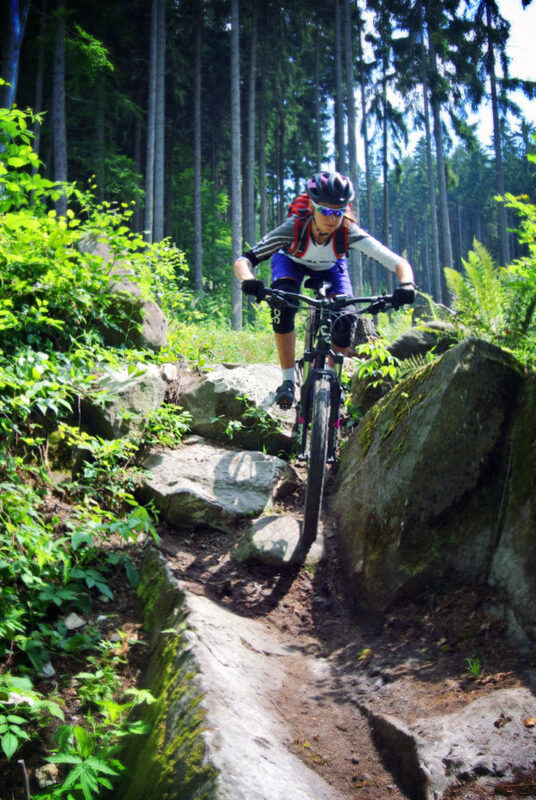 Trail Pod jeskyňkou (GPS) is a natural raw 2 km long enduro trail which offers nice technical steep and also fast rocky and rooty sections. Highlight of this trail is definitely the Whistler section. 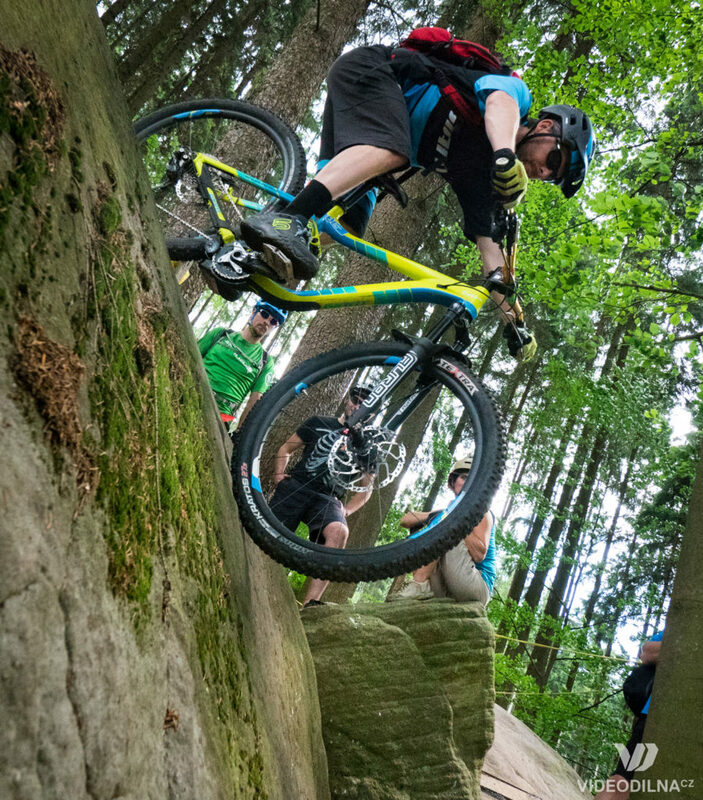 One of the hardest technical line in Czech trail centers, it is a real challenge for mountain bikers. For less advanced riders there is a easier B line. 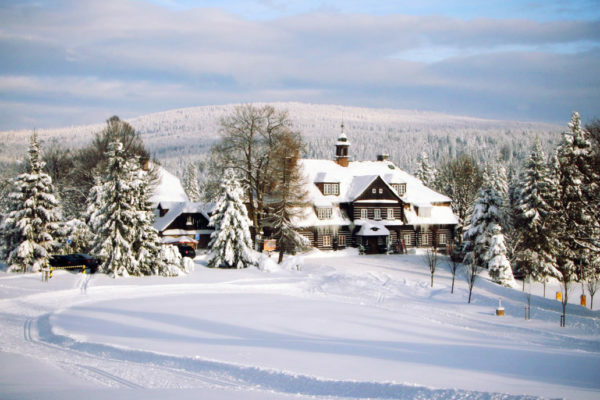 And at the end of the ride you can get back the calories lost in a pub just next to the trail head (typical Czech cusine) and called “Lhotecká hospoda” or go to another one very close to Trutnov Trails headquarter called Restaurant Poříčí (1,5 km – also Czech cusine but with some nice vegetarian plates). I like the fact that here you can park your car with the bikes and see them while eating (just put them in the parking with the big green pipes on the other side of the creek). It is also a good posibility for spending the night at a reasonable price as they have a few rooms above the restaurant. If you have bigger budget we recommend Nelly Kelly’s, the best in town. If you would like to see more bunkers I recommend to ride to Stachelberg (GPS). 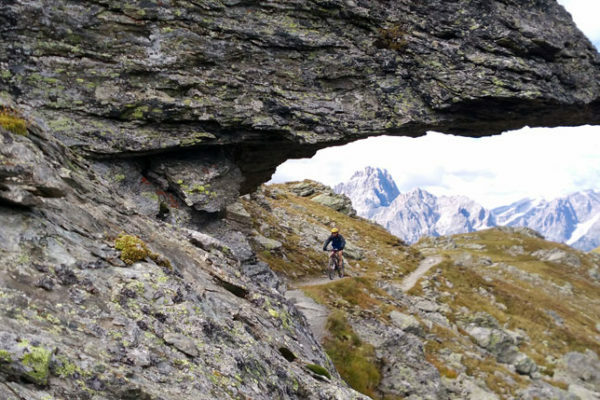 You can even go there by car if you are tired of biking. 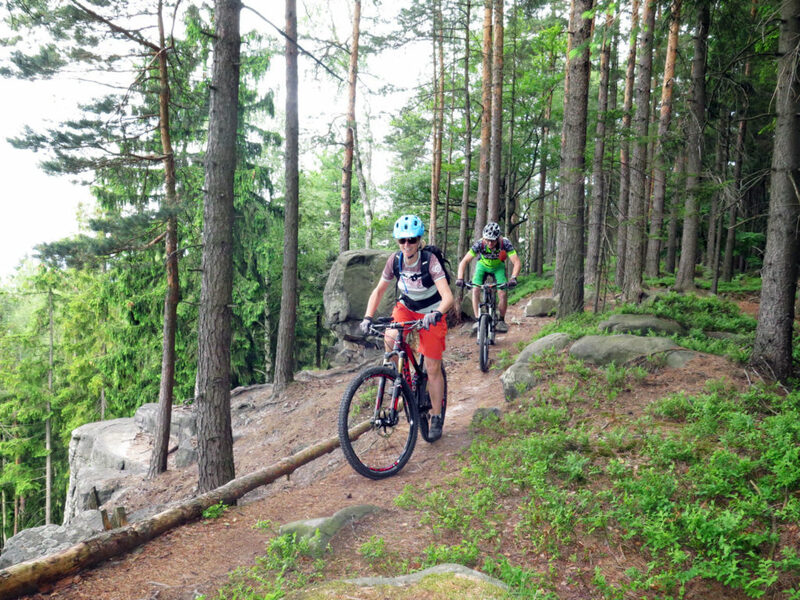 If you would like more hard riding you should ride the trails from the famous race MTB Trilogy, in the Broumovsko region. 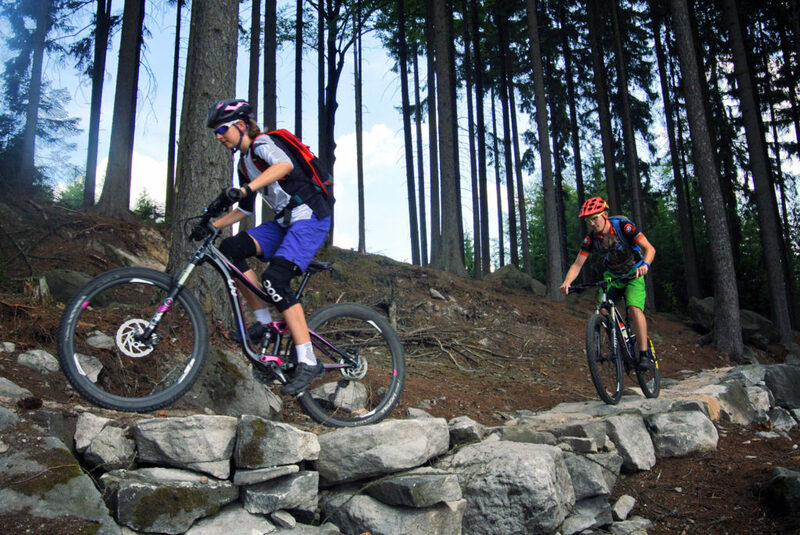 If you would like to visit a bike park, check Bike park Vlčka. 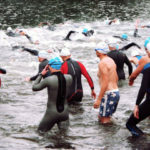 If you want to relax after riding we recommend to go swimming at Dolce lake. If you would like to hike check the super famous rock town of Adrspach-Teplice. Or you can climb Mount Sněžka, the highest Czech mountain (1603 mt). 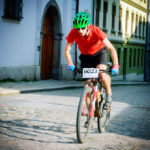 24h MTB race: suffering is fun! 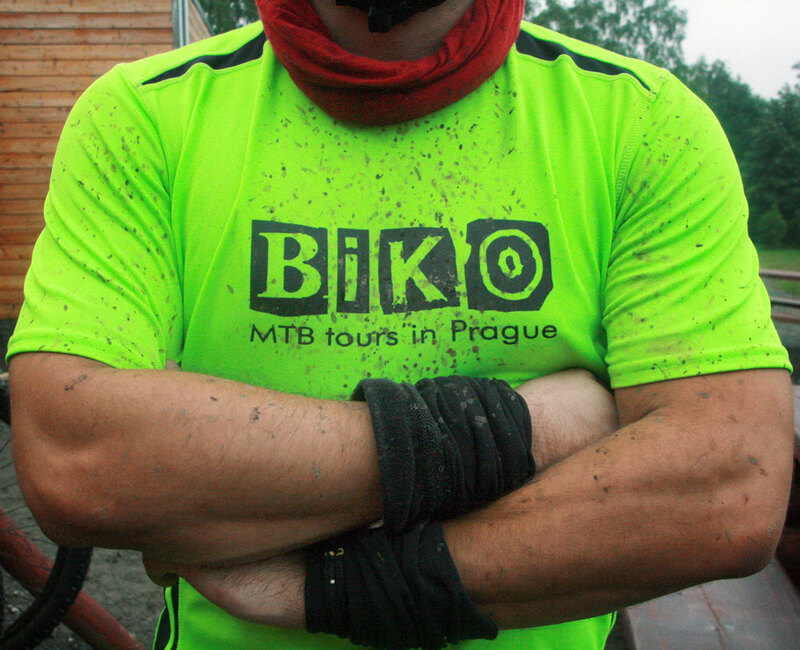 We are an outdoor family company based in Prague. 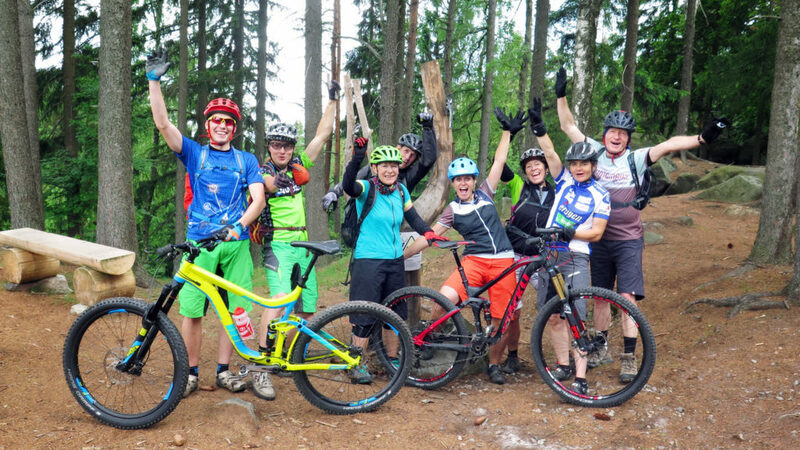 A bunch of enthusiastic locals who know every cm of forest around Prague and not only and we want to share our knowledge with you.